Hollywood rarely produces sword-and-sorcery movies. The entire genre was turned over to Italy in the '50s and '60s, and Italian filmmakers responded with scores of muscle-bound movies featuring the exploits of Hercules, Samson, and Goliath. But American filmmakers have usually shied away. Only a handful of classics exist, such as Jason and the Argonauts (1963) and The Seventh Voyage of Sinbad (1958). So maybe it's fitting that the newest American-made entry in the sword-and-sorcery genre, Kull the Conqueror, was directed by the son of Italian immigrants and produced by the daughter of legendary film producer Dino De Laurentiis. Director John Nicolella (best known for producing the trend-setting television series Miami Vice) and producer Raffaella De Laurentiis (best known for producing Conan the Barbarian) have crafted an action-filled tale that never takes itself too seriously. With pulsating heavy metal guitars grinding during the battle scenes, Kull the Conqueror surges forward while buoyed by the infectious grin of Kevin Sorbo. And it's that grin that really makes the difference. While other actors may have only offered a scowl or a leer, Sorbo acts like he's having fun. His powerful muscles are matched by good acting instincts. It's hard to imagine Arnold Schwarzenegger playing Kull. While Arnold can certainly swing a mean axe just like Sorbo, Arnold can only either overpower you physically or upset your expectations by becoming goofy (as when he plays off of his own muscle-bound image). He doesn't play many characters between those extremes. However, Sorbo thrives on those scenes where he isn't in control, where things have gone wrong and now he has to pick up the pieces. He can play the big action scenes convincingly and then play the quieter comedy scenes with a gentle, self-deprecating style. 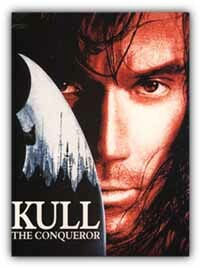 Kevin Sorbo in Kull the Conqueror. The character Kull (created by famed pulp fiction writer Robert E. Howard, who also created Conan the Barbarian) isn't much different than the character Hercules on Hercules: The Legendary Journeys. Likewise, Kull the Conqueror resembles what you'd get if the makers of Hercules had a bigger budget and 90 minutes to work with. The canvas is broader, the actions are bolder, and the slapstick comedy is reduced to a minimum in Kull, but if you're familiar with TV's Hercules, you'll have a good idea of what to expect. The filmmakers use an approach that comes close to camp at times. They definitely weren't taking this project too seriously . They crafted a relatively small-scale story that gives us dramatic scenes that work just as well as the action scenes. 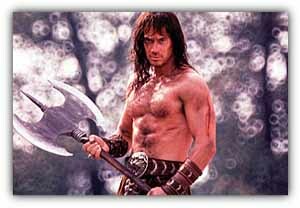 Set in the mythical land of Vallusia, Kull gives us Kevin Sorbo as a warrior who worked for five long years chained to the oar of a pirate galley. Now, he's roaming the countryside, getting into occasional skirmishes. One day he stumbles into a political squabble in a local kingdom, and before he knows it, the king passes down his crown to Kull--so as to keep it out of the hands of the king's scheming relatives. Somewhat reluctantly Kull accepts the honor, but before long he's trying to revise laws and abolish slavery. As the movie's posters boast: "As a solider, he rocks. As a king, he rules." The dead king's sons, however, will do anything to get their hands on the crown and they arrange for an evil witch to be resurrected. Played by Tia Carrere, Akivasha is a vengeful witch who eagerly accepts the invitation to gain control of the kingdom by vamping Kull, becoming queen, and then killing him. Akivasha completely overhelms Kull. Within seconds after meeting her, he chooses her to be his bride. "Your bride is over 3,000 years old," says a friend. "She said she was 19!" says an astonished Kull. Once she takes her place as Queen, Kull finds out her true nature. He quickly discovers the only way to defeat Akivasha is to embark on a perilous Arctic journey for the Breath of Valla, the only weapon powerful enough to destroy the witch. With director John Nicolella in charge, Kull moves at a surprisingly fast pace. He avoids turning the story into a big-scaled epic. He keeps the scale small and puts much of the emphasis on the characters and their interaction. We get a strong-willed slave girl (Karina Lombard), an enslaved priest who becomes Kull's ally (played by native American actor Litefoot), and a court-appointed aide (played by veteran character actor Roy Brocksmith) who constantly warns Kull about not making changes in Vallusia. Meanwhile, Tia Carrere casts piercing stares like the witch in the Hong Kong classic Bride with White Hair. In addition, we get Harvey Fierstein as a scheming slave trader, and he nearly steals the movie with a delightfully funny performance. Kull is a good, efficient action tale told with plenty of gusto. Nicolella's deft use of comedy keeps the movie from ever becoming ponderous and Kevin Sorbo provides the movie with a strong, charming, charismatic main character. Sorbo may not be in the same acting category as Robert De Niro or even Sylvester Stallone, but he's a strong actor who should have a promising future on the big screen.